There’s a lot to do in Denver, but three days gives you plenty of time to take in much of what the city has to offer without feeling like you’ve rushed through the sights. In other words, take your time, relax and enjoy. The first day is a good day to walk around LoDo, Larimer Square, explore the 16th Street Mall, and generally get your bearings. Start the day at the 16th Street Mall at Wazee Street. Designed in 1982 by I.M. Pei, the 16th Street Mall is a mile-long pedestrian promenade lined with outdoor cafes and retail shops. This is a great place to launch your first day of adventure. Free shuttles run the length of the mall stopping at every intersection making it easy to cover a lot of ground quickly. You&apos;ll want to stop in many of the shops but one you won&apos;t want to miss is where you begin. A Denver original, fashion pioneer Papa Jack Weil invented the western snap-button shirt and opened shop back in 1946. He sold his shirts to presidents and rock stars alike including Eric Clapton and Bruce Springsteen. Stop by the Rockmount Ranch Wear flagship store and museum to browse the incredible selection of western-style shirts, hats and accessories. Papa Jack passed away at the grand old age of 107 in 2008, but his Mile High City Spirit lives on at this great Denver store. The Tattered Cover is one of the nation&apos;s largest and most well known independent bookstores and often hosts signings by some of the literary world&apos;s most famous authors. From the second you walk in the door, it&apos;s easy to see why locals and visitors alike love Tattered Cover. With great views of Union Station, the treasured bookstore offers one of the most extensive collections of books about Denver and Colorado. After perusing the Tattered Cover, spend some time walking around one of Denver&apos;s favorite neighborhoods. Day or night, LoDo is a must see. By day, this historic 28-square-block area of restored Victorian buildings and renovated turn-of-the-century warehouses makes for an interesting study in architecture. By night, the restaurants, live music venues, sports bars and brewpubs that pack the area make LoDo the entertainment epicenter of Denver. No trip through LoDo would be complete without at least peeking through the gates of Coors Field (2001 Blake St.) If baseball is a passion, taking in a tour or game is definitely in order. On the western side (toward the mountains) of LoDo take a step further back in time and check out your next stop for the day. The Denver Performing Arts Complex is the cultural hub of The Mile High City encompassing opera, theater, stage, dance and music. A variety of cultural enrichment awaits you. From symphony and orchestral arrangements, jazz, and musicals to performances by dance companies, theatrical extravaganzas, one-person shows, plays, stand-up comics and more. Most shows and performances require planning ahead and purchasing tickets before the day of the show. Denver&apos;s oldest block is also it&apos;s most trendy. The shops and boutiques of Larimer Square carry the latest fashions from New York to Milan. Charming and elegant, gas lamps line the street as the mountain views remind you of what lured you here in the first place. With several restaurants and nightclubs, Larimer Square is a great place for dinner and to end your first day in Denver. Take in the Kirkland Museum&apos;s collection of 20th century decorative arts. On display are more than 3,300 works of Arts & Crafts, Art Nouveau, Glasgow Style, Wiener Werkstatte, De Stijl, Bauhaus, Art Deco, Modern, and Pop Art. Additionally, a major survey of Colorado art history is documented, with over 170 artists represented by more than 700 works with a strong focus on the first thee quarters of the 20th century. Also, be sure to view the retrospective of Colorado&apos;s distinguished painter Vance Kirkland (1904-1981). No trip to Denver would be complete without a stop by the house of its most famous prospector, Molly Brown. Margaret "Molly" Brown gained wealth during Denver&apos;s gold rush days and fame as a Titanic survivor, earning her the nickname "Unsinkable Molly." This historic turn-of-the-century mansion contains original furnishings and mementos including furniture, china, silver, artwork, photographs and textiles. Her adventurous travels often overshadowed her philanthropic and political contributions. The Molly Brown House Museum is a great place to learn about all facets of the woman and the times in which she lived. Close to City Park lies a neighborhood filled with numerous dining choices: Uptown. From upscale Italian to casual Vietnamese, to local favorites like Steuben&apos;s and beast + bottle, you can easily walk this area filled with diverse option. Aside from being a geological wonder 70 million years in the making, Red Rocks Park & Amphitheatre is one of the world&apos;s most famous concert sites and a must see for any music enthusiast. Well-known symphonies, and bands ranging from The Beatles to U2, have graced the stage, which is surrounded by dramatic, 500-foot high red sandstone cliffs. Trails surrounding the concert venue and a spectacular view of the plains make it a perfect place for moderately challenging hikes. There are also dinosaur tracks and fossil fragments dating back 160 million years to captivate students, families and geology fans. Want a unique way to get there? Try renting a scooter from ScooTours Denver. They supply everything you need for a fun ride through the foothills. When you&apos;re finished imagining what it would have been like to witness some of the world&apos;s greatest musicians performing in such a breathtaking venue, head to Golden where you&apos;ll find your next attraction. William F. "Buffalo Bill" Cody epitomized the Old West. After leaving his boyhood home in Leavenworth, Kansas at age 11, he went on to become a cattle herder, worked on a wagon train, mined for gold, rode in the Pony Express, scouted for the Army, and traveled the world with the Buffalo Bill&apos;s Wild West shows. Upon his request he was buried atop Lookout Mountain in 1917. The Buffalo Bill Museum & Grave opened in 1921 and offers a look into life in the Old West. It contains exhibits on Buffalo Bill&apos;s life, the Wild West shows, Indian artifacts including Sitting Bull&apos;s bows and arrows, Western art and firearms. After exploring the life of the famous frontiersman, head back to Denver for some shopping and fine dining. Cherry Creek North and Cherry Creek Shopping Center make up Denver&apos;s preeminent shopping and dining district. Cherry Creek North is a 16-block shopping and dining extravaganza and home to more than 320 independently owned shops, boutiques, galleries, restaurants and spas. Adjacent to Cherry Creek North is the upscale Cherry Creek Mall with an additional 160 brand name stores that when added together create the largest, most diverse shopping district between Chicago and San Francisco. 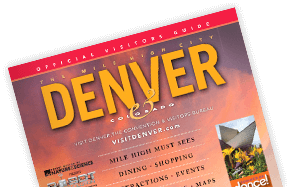 Spend the afternoon browsing one-of-a-kind items and looking for the perfect memento of your trip to The Mile High City. After you&apos;ve shopped to your heart&apos;s content, there are more than 50 restaurants to choose from in the neighborhood including some that are gaining national recognition as some of the finest in the country. Thus concludes the final day of your whirlwind adventure around Denver.